Can you say "Heavy Duty"? This is the big brother to the G0757 Series Mills and includes many of the same features as the smaller G0757 Series Mills, but with rugged oil-bath gear-driven spindles, a wide range of speeds, and a colossal 11" x 50" table. 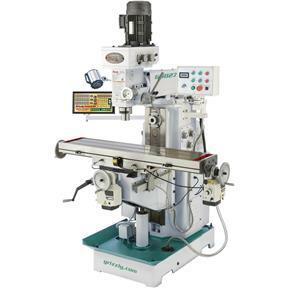 If you're looking for the unwavering torque and consistency of the solid gearhead mill then this is it. It's got all the range of speeds you need combined with the size and features that any metalworking shop would want. Base footprint: 41" x 24"
Approximate shipping weight: 2866 lb.